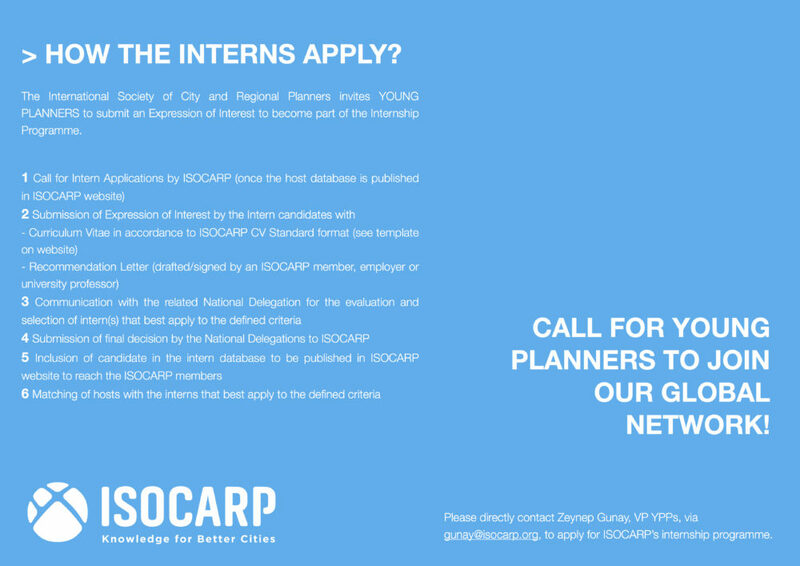 ISOCARP invites the institutional members of ISOCARP and ISOCARP National Delegations, as well as national, regional and city governments, planning agencies, universities and research institutions to submit an Expression of Interest to host Internship Programme for young planners. A particular focus and commitment of ISOCARP is on young generations through facilitating knowledge for better cities with the youth. It is the aim of ISOCARP to provide knowledge transfer and life-long learning between institutions, professionals and the society. The success of the YPP network is therefore dependent upon the rich outreach of the individual and institutional members of the Society. The internship programme is an effective opportunity for the members to utilise their individual and institutional knowledge territories for the youth. Reaching the youth before professional life will also empower YPP as a tool for increasing the international visibility and recognition of ISOCARP as well as a tool for attracting new members. 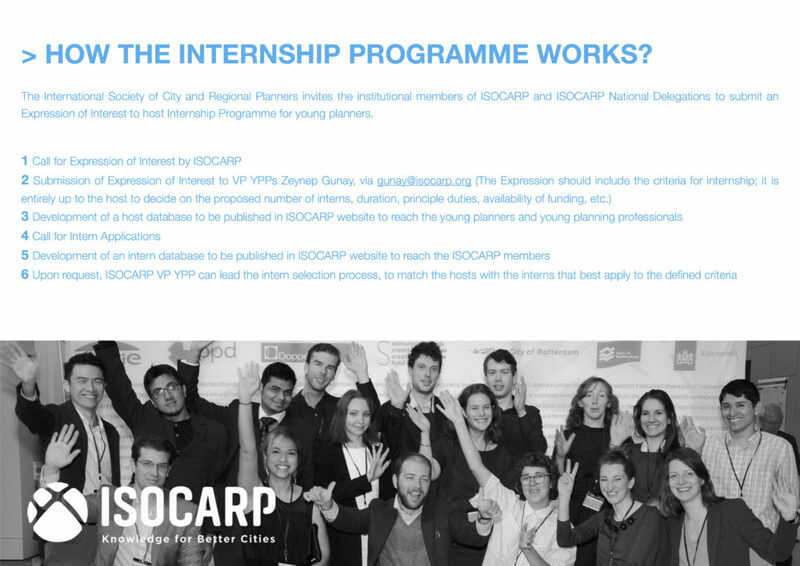 The goal of the Internship Programme is to stimulate collaboration between ISOCARP and interested parties in order to mentor young planning professionals in their academic and professional life. Interested parties wishing to express their interest in establishing a Internship Agreement are asked to send ISOCARP a detailed letter of expression of interest. Please check out the manual for more information! Please click on the link to download ISOCARP Standard CV Template. In 2016, ISOCARP celebrated an important event in the history of the Society – the 25th anniversary of the Young Planning Professionals’ Programme! 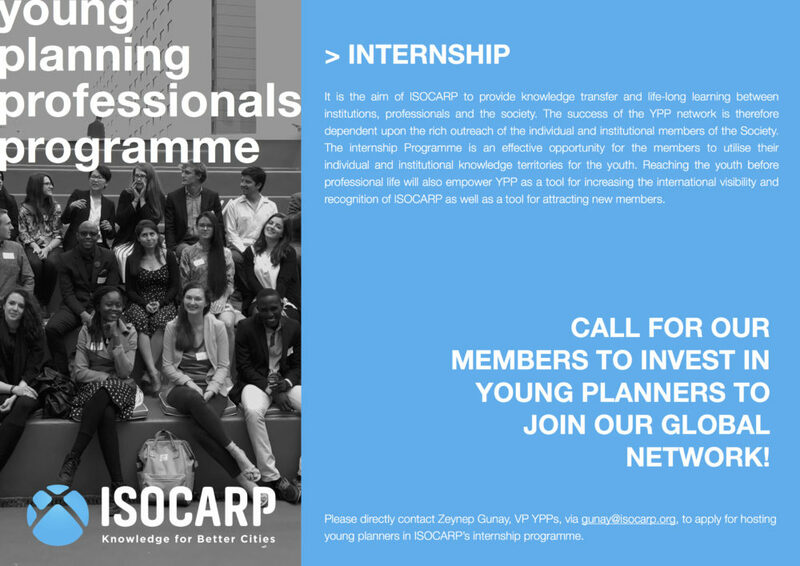 The Young Planning Professionals’ Programme is a crucial component of ISOCARP’s dedication to promote and enhance the planning profession. The objective is to contribute to the knowledge base and improve skills of young professionals, the future leaders of our profession.